DAZN (pronounced "Da Zone"; /dəˈzoʊn/ də-ZOHN) is a subscription video streaming service owned by Perform Group. The service is dedicated to sports, offering live and on-demand streaming of events from various properties. It first launched in Austria, Germany, Japan, and Switzerland in August 2016, and in Canada the following year. It was launched in the United States and Italy in 2018, and will launch in Spain and Brazil in 2019. DAZN first launched in Austria, Germany, and Switzerland on 10 August 2016, closely followed by Japan on 23 August 2016. In July 2017, DAZN announced that it would expand into Canada, after having acquired OTT streaming rights to the National Football League in Canada, including NFL Game Pass and access to NFL RedZone; as a result of the deal, television providers would no longer sell the out-of-market sports package NFL Sunday Ticket to residential customers. The DAZN deal does not affect the NFL's newly-extended linear television rights deal with Bell Media. On 8 August 2017, DAZN reached a deal to sublicense content from beIN Sports Canada, including selected UEFA Champions League and UEFA Europa League matches (themselves sub-licensed from TSN), as well as other international sports rights. The Canadian launch was met with technical issues; DAZN apologized for the "inadequate service" that it delivered, and stated that it was working to rectify them. However, users still reported problems, including inconsistent stream qualities, buffering, and latency between the streams and television broadcasts. As a result, DAZN began to distribute NFL Sunday Ticket to television providers in October 2017, as had been the case before. On 20 November 2017, DAZN acquired Canadian rights to FIBA events. In February 2018, DAZN acquired Canadian broadcast rights to the 2018 Commonwealth Games (later sub-licensing portions of the coverage to CBC Sports), and subsumed Major League Soccer's digital out-of-market service MLS Live—with live and on-demand streaming of matches featuring U.S. teams (matches with Canadian teams will only be available after a 48-hour delay to protect the league's main rightsholders TSN and TVA Sports). Roku support was also added that month. On 25 May 2018, DAZN announced that it had acquired exclusive Canadian rights to the UEFA Champions League and Europa League, beginning in the 2018–19 season and replacing TSN. In December 2018, it was reported that DAZN had acquired Canadian rights to the Premier League, replacing Sportsnet and TSN. On 8 May 2018, DAZN parent Perform Group announced that it had hired former ESPN president John Skipper as executive chairman. Two days later, DAZN announced that it would launch in the United States, and that it had reached a major broadcasting deal with Eddie Hearn's Matchroom Sport. Under the deal, DAZN will stream 32 cards per-year, including 16 British Sky Sports Box Office cards, as well as 16 (with four described by Hearn as being "absolute monsters") that will be held in the United States under the new Matchroom Boxing USA banner. Hearn claimed that the deal, which will last for at least two years, with an option for a six-year extension (totalling US$1 billion over the life of the contract if realized), was a "groundbreaking deal in the history of [boxing]". On 26 June 2018, DAZN announced a five-year streaming rights deal with the Viacom-owned mixed martial arts promotion Bellator, which began with Bellator 206 on 29 September 2018, and includes the U.S. and all other regions currently served by DAZN. The rights include seven exclusive events per-year, as well as all events televised by Paramount Network. DAZN officially launched in the U.S. in September 2018, ahead of its first boxing event—Anthony Joshua vs. Alexander Povetkin, on 22 September. Its launch content also includes the World Boxing Super Series, as well as the AFC Champions League, the Chilean Primera Division, J-League, and other content. DAZN's broadcast team for its U.S. boxing events will be led by "Sugar" Ray Leonard and Brian Kenny on play-by-play, with LZ Granderson as ringside reporter, and Michael Buffer as ring announcer. Buffer appeared in a U.S. marketing campaign for the service, which contrasted DAZN's subscription model to traditional pay-per-views. On 17 October 2018, DAZN announced that it had signed a five-year, 11-fight deal with Mexican boxer Canelo Álvarez valued at $365 million, beginning with his upcoming bout against Rocky Fielding in December for the WBA super middleweight title. Álvarez was previously aligned with HBO, which had announced that it would discontinue boxing broadcasts. In November 2018, DAZN announced a three-year content partnership with Major League Baseball, under which the service will co-produce ChangeUp—a live nightly program with live look-ins and highlights of games, and other on-demand content. The program will be hosted by previous ESPN Baseball Tonight anchor Adnan Virk. In January 2019, DAZN acquired the rights to broadcast the AFC Asian Cup in the United States and Canada, beginning with the quarter-finals. In March 2019, DAZN doubled its U.S. monthly cost. DAZN offers more than 8,000 sport events a year, ranging from major to minor competitions including the Premier League, Bundesliga, La Liga, National Basketball Association, National Football League, Major League Baseball, National Hockey League, Formula One, and Bellator MMA. DAZN is the host broadcaster of Japan's J.League, broadcasting every game of the season across all three divisions. Some of the most popular rights are listed in the table below. DAZN is supposed to be available in 1080p HD quality on a wide variety of devices including computers/laptops, mobile, tablet, set-top boxes, smart TVs and video game consoles and access via personal data is only possible through an account and then only by payment with PayPal or access through credit cards and third parties IE by telecommunications companies or audiovisual companies. The DAZN app is available for Android mobile and tablet devices through the Google Play store (version 4.4 and above) and on iOS devices running iOS 8.0+ including iPhone, iPod Touch and iPad. DAZN is also available on connected devices including Amazon Fire TV, Fire TV Stick and Android TV. ^ DAZN. "DAZN LinkedIn Profile". Retrieved 28 February 2019. ^ "Blavatnik's Perform Group rebuffs tech investors to build 'Netflix for sport'". The Daily Telegraph. Retrieved 20 August 2016. 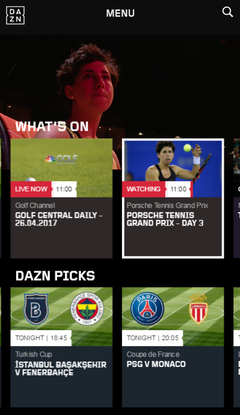 ^ "Dazn.com Site Overview". Alexa Internet. Retrieved 25 April 2017. ^ "Perform's DAZN sport network launches in Japan". SBC News. Retrieved 23 August 2016. ^ "DAZN: Kosten und Programm des Sport-Streaming-Dienstes". SBC News. Retrieved 10 August 2016. ^ "Live sports streaming service DAZN expands into Japan". Japan Today. Retrieved 24 August 2016. ^ "Perform Group launches German OTT live sports portal DAZN". Broadband TV News. Retrieved 10 August 2016. ^ "Self-professed 'Netflix of sports' app DAZN launches in Canada with all NFL games". CBC News. Retrieved 21 July 2017. ^ "DAZN, the Netflix of sports, launches in Canada with exclusive NFL streaming rights". Financial Post. 20 July 2017. Retrieved 21 July 2017. ^ "Streaming service DAZN buys Canadian NFL rights". Toronto Sun. Retrieved 24 July 2017. ^ "DAZN sub-licenses BeIN Sports rights package in Canada". SportsPro. Retrieved 23 August 2017. ^ "NFL apologizes for 'inadequate service' that left Canadian DAZN viewers fuming in Week 1". National Post. 12 September 2017. Retrieved 15 September 2017. ^ a b "DAZN working on making all NFL games available via cable, satellite providers". National Post. 7 October 2017. Retrieved 10 October 2017. ^ "DAZN picks up Fiba rights in Canada". SportsPro. Retrieved 21 November 2017. ^ "CBC enters agreement with DAZN to show Commonwealth Games highlights". Winnipeg Free Press. The Canadian Press. 29 March 2018. Retrieved 1 April 2018. ^ Armstrong, Laura (2 March 2018). "MLS partners with DAZN to live stream U.S. matches for Canadian soccer fans". Toronto Star. ISSN 0319-0781. Retrieved 4 March 2018. ^ "DAZN acquires Commonwealth Games rights in Canada". SportsPro. Retrieved 4 March 2018. ^ a b c Behar, Rose (18 February 2018). "Sports streaming platform DAZN launches on Roku in Canada". MobileSyrup. Retrieved 14 May 2018. ^ "DAZN scoops up Canadian UEFA Champions League rights". The Province. 25 May 2018. Retrieved 26 May 2018. ^ "DAZN gets Canadian broadcast rights for Champions League soccer". The Globe and Mail. The Canadian Press. Retrieved 26 May 2018. ^ "TSN, Sportsnet losing English Premier League Canadian broadcast rights". 2018-12-08. Retrieved 2018-12-08. ^ Littleton, Cynthia (2018-05-08). "Former ESPN Chief John Skipper Joins Len Blavatnik's Perform Group as Chairman". Variety. Retrieved 2018-11-26. ^ "Hearn has big U.S. plans with $1B DAZN deal". ESPN. Retrieved 11 May 2018. ^ Mitchell, Kevin (10 May 2018). "Eddie Hearn boasts $1bn transatlantic streaming deal is 'biggest ever in boxing'". The Guardian. Retrieved 11 May 2018. ^ Holloway, Daniel (26 June 2018). "Viacom's Bellator MMA Signs Multi-Year Deal With OTT Service DAZN". Variety. Retrieved 27 June 2018. ^ "Bellator announces broadcast deal with streaming service DAZN". MMA Fighting. Retrieved 27 June 2018. ^ "DAZN makes its U.S. debut". Awful Announcing. 2018-09-11. Retrieved 2018-09-16. ^ "Streaming service DAZN wants to sell US sports without commercials". Qz.com. Retrieved 2018-09-16. ^ "Canelo Alvarez, Michael Buffer Take Shots At Pay-Per-View In DAZN Ad". Sports Business Daily. Retrieved 2018-11-17. ^ Steinberg, Brian (2018-09-17). "'Sugar' Ray Leonard, Brian Kenny Among Ringside Team for DAZN Boxing". Variety. Retrieved 2018-09-18. ^ "Canelo signs 11-fight, $365M deal with DAZN". ESPN.com. Retrieved 2018-10-18. ^ "Saul 'Canelo' Alvarez signs 'most lucrative' deal with sports service DAZN". BBC Sport. 2018-10-17. Retrieved 2018-10-18. ^ Staff, SVG. "DAZN Reaches Three Year Rights Deal With MLB; Will Produce Live Weeknight Show". Sports Video Group. Retrieved 2018-11-21. ^ "Adnan Virk joins DAZN to helm MLB show "ChangeUp"". Awful Announcing. 2019-03-14. Retrieved 2019-03-15. ^ "DAZN doubles monthly subscription fee, hoping to steer fans towards new annual option". Awful Announcing. 2019-03-21. Retrieved 2019-03-21. ^ "Netflix-style service launched in Germany". Daily Mail. Retrieved 12 August 2016. ^ "Perform Secures J League streaming rights". SBC News. Retrieved 22 July 2016. ^ "DAZN TO REVOLUTIONIZE THE WAY FANS WATCH SPORT IN SPAIN | DAZN Media Centre". DAZN Media Centre. 2018-11-13. Retrieved 2018-11-13. ^ "DAZN ACCELERATES GLOBAL EXPANSION AS SPAIN BECOMES EIGHTH LIVE MARKET". DAZN Media Centre. 2019-02-27. Retrieved 2019-03-05. ^ "DAZN TO LAUNCH SPORTS STREAMING SERVICE IN BRAZIL | DAZN Media Centre". DAZN Media Centre. 2018-11-29. Retrieved 2018-12-02. ^ "List of international broadcasters". La Liga. Retrieved 27 April 2017. ^ "DAZNでリーガ・エスパニョーラの放映が決定！　4月1日より最大5試合を生配信". Mainichi Shimbun. Retrieved 29 March 2017. ^ "Premier League international rights deals for 2016-2019". Premier League. Retrieved 27 April 2017. ^ a b "DAZN TO REVOLUTIONIZE THE WAY FANS WATCH SPORT IN SPAIN | DAZN Media Centre". DAZN Media Centre. 13 November 2018. Retrieved 27 November 2018. ^ "DAZN SICHERT SICH DEN TRADITIONSREICHEN FA-CUP FÜR INSGESAMT SECHS SPIELZEITEN". DAZN Media Centre. 18 October 2018. Retrieved 22 December 2018. ^ "International Broadcasters Ligue 1". Ligue 1. Retrieved 27 April 2017. ^ "Neuer Streamingdienst DAZN zeigt Bundesliga-Highlights". Eurosport. Retrieved 10 August 2016. ^ "Canadian Fans Will Be Able To Watch Ronaldo On DAZN After 3-Year Exclusive Rights Deal Is Announced". Forbes. 13 August 2018. ^ Harris, Christopher (2019-01-23). "DAZN acquires Asian Cup rights in US". World Soccer Talk. Retrieved 2019-01-24. ^ "Indian Super Cup TV Channels to Watch the ISL on Television". Live sport squad. Retrieved 25 February 2018. ^ "DAZN Canada, Major League Soccer sign 3-year deal". Major League Soccer. Retrieved 2 March 2018. ^ "NBA International Broadcast Information". National Basketball Association. Retrieved 27 April 2017. ^ a b DE, DAZN HELP (18 October 2018). "In der NHL zeigen wir etwa 150 Spiele, 3-5 pro Woche. In der NBA zeigen wir ca. 200 Spiele, mind. 1 Spiel pro Tag. In der NCAA können wir 3 Spiele pro Woche zeigen. Das inkludiert Basketball als auch Football. Wir versuchen ein ausgewogenes Programm zu erstellen. (TA)". Retrieved 22 December 2018. ^ "EUROLEAGUE BASKETBALL AND DAZN SIGN EXCLUSIVE BROADCAST DEAL IN SPAIN UNTIL 2023 | DAZN Media Centre". DAZN Media Centre. 27 November 2018. Retrieved 27 November 2018. ^ "NFL, NBA & Co: Wo Sie US-Sport gucken können – und was es kostet". test.de. Retrieved 6 September 2016. ^ "DAZN holt sich MLB-Rechte". Color of Sports. Retrieved 27 April 2017. ^ "DAZN secures MLB rights for Germany". Broadband TV News. Retrieved 28 March 2017. ^ "DAZN becomes true 'Home of Sport' in Japan". DAZN Media Report. Retrieved 2019-02-12. ^ "FIH Pro League". www.fihproleague.com. Retrieved 2019-01-26. ^ "The EHL KO16 Broadcast Schedule - where to watch the world's best club hockey". EHL. Retrieved 2019-01-26. ^ "DAZN Spain nets exclusive World Rally Championship rights". Telecompaper. Retrieved 24 January 2019. ^ "Watch Live • World Championship of Ping Pong". World Championship of Ping Pong. Retrieved 2019-01-26. ^ rjblake. "Challenge Cup - Fixtures and Results". European Professional Club Rugby. Retrieved 22 December 2018. ^ "International Broadcasters". Premiership Rugby. Retrieved 19 December 2017. ^ "Where to watch World Rugby events". World Rugby. Retrieved 19 December 2017. ^ a b "So viel sei euch auch schon mal verraten. Ab sofort zeigen wir auch die @ufc auf DAZN. Alle knackigen Details gibt es in unserem Presse-Release am Montag. #DAZNfightclub (only D+AT)". Twitter. Retrieved 22 September 2018. ^ "UFC announces multi-year deal for all live events with DAZN". UFC. Retrieved 30 August 2016. ^ "Bellator & DAZN sign global multi-year MMA streaming partnership". Perform Group. Retrieved 26 June 2018. ^ Eaton, Matt (2018-10-31). "ROAD FC inks US broadcast deal with DAZN". The Fight Nation. Retrieved 2019-01-01. ^ Promotions, Golden Boy. "Canelo Alvarez & Golden Boy Promotions Sign Historic Five-Year Partnership With Global Sports Streaming Leader DAZN". Prnewswire.com. Retrieved 2018-10-18. ^ "MATCHROOM BOXING AND PERFORM GROUP SEAL BOXING'S FIRST BILLION DOLLAR DEAL". Perform Group. Retrieved 10 May 2018. ^ "DAZN BRINGS THE QUEST FOR THE MUHAMMAD ALI TROPHY TO CANADA". Perform Group. Retrieved 15 August 2018. ^ "WWE and DAZN announce exclusive multy-year agreement in Japan". Yahoo! Finance. Retrieved 10 April 2017. ^ "Darts on TV | PDC". www.pdc.tv. Retrieved 2019-03-19. ^ "What devices can I stream DAZN on?". DAZN Help. Retrieved 27 April 2017. ^ "スポーツのライブストリーミングサービス『DAZN（ダ・ゾーン）』 4月4日より「Chromecast」への対応開始". PR Times. Retrieved 4 April 2016. ^ a b "DAZN launches on the Roku platform in Canada" (Press release). Toronto: DAZN. 18 February 2018. Retrieved 14 May 2018. ^ a b "Supported Devices Homepage Canada". DAZN. Retrieved 14 May 2018.